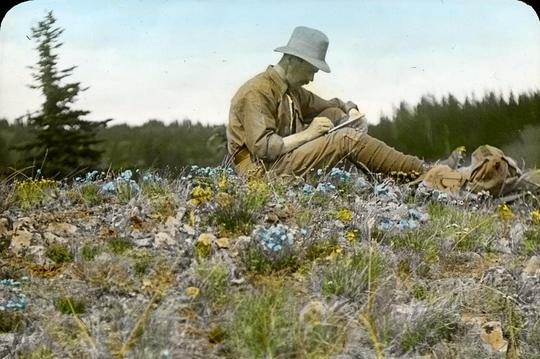 botany : Botanist JOHN DAVIDSON... working on Skwoach Mountain, Canada. Circa 1915. You can return to our botany page or browse the pictures using the next and previous links. Botanist JOHN DAVIDSON... working on Skwoach Mountain, Canada. Circa 1915. John Davidson worked at the University of Aberdeen before being appointed the first Provincial Botanist of British Columbia. THE UNIVERSITY OF BRITISH COLUMBIA BOTANICAL GARDEN. Davidson established a herbarium in Vancouver and a botanical garden near New Westminster. This was moved to the University of British Columbia in 1916, where it became the UBC Botanical Garden. It is the oldest botanical garden at a university in Canada. Photo ~ UBC Botanical Garden archives. Next picture is another photo of John Davidson. He's really concentrating on his work. Fantastic place to work , a dream ! and...sorry again, Jac..Lol. David got here first and put it on GoYpedia ! Lol. Hmmm....I think I've seen this photo before. LOL. Great piece of information TT. Thanks Terra - Canada's a nice place to work, eh? I think this must have been a sepia photo that has been hand coloured? Agree, Lily.. I couldn't sit like that for long at any age ! You normally tell a man when he get s to a certain age as he grows hairs out his ears and nose lmao. Lovely picture I wonder what he was sketching.